Pre-designed kit concepts. Use these kits as is, add some accessories, reconfigure them or start from scratch. With Hyperlite, it’s entirely up to you. 10′ x 10′ Hyperlite hybrid truss package. Includes 3 lights & 1 case. 10′ x 10′ Hyperlite hybrid truss package with hidden storage area. 4 lights & 1 case. 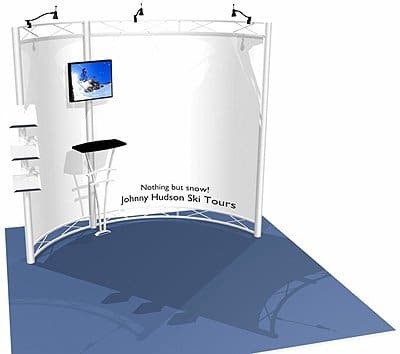 10′ x 20′ Hyperlite hybrid truss display package. Includes 8 lights & 2 cases.